Several types of multipurpose scales are available for agricultural and industrial applications. Multipurpose scales used in agricultural applications are necessary because these scales weigh a variety of livestock. Because many farms and ranches raise different types of livestock, multipurpose scales provide a versatile weighing solution for monitoring the weight of all types of livestock, from sheep and goats to cattle. However, our scales that are designed for smaller animals are lower to the ground, making it easier for a smaller animal to step onto the platform. Those scales designed for larger livestock are also low profile for ease of weighing the larger animal. There is no need to force the larger animal to step up onto a high platform with this type of equipment. Specialized scales, such as those designed to weigh hogs, may include an enclosure cage to keep the animal in place during the weighing process. Multipurpose industrial scales may be used to weigh a variety of cargo. For example, scales in a warehouse environment may be used to weigh a variety of stored products. Livestock scales are an example of multipurpose scales that are used for a variety of purposes. Because livestock farms depend on accurate measurement of animals, a weighing solution that is versatile, mobile and accurate is necessary. Because the livestock farmer’s profit depends on the weight of livestock when the animals go to market, obtaining accurate weight results is essential. Livestock scales must be accurate when utilized in any area. The scales must be accurate when assessing the weight of smaller livestock, as well as larger animals. Our multipurpose livestock scales produce accurate results every time. Our scales are manufactured with stainless steel load cells that are rugged and durable, consistently producing accurate results for every application. Effective livestock scales should be easy to move from one location to another, allowing weight assessment in a location familiar to the animal. When animals must be moved to an unfamiliar location for weighing, the animals may become overly stressed. Excessive urination and stress-related weight loss due to moving the animal to unfamiliar territory, such as a weighing station, directly cuts into the profit of the livestock farm. Studies show that animals may lose between five and eight percent of their body weight when moving from one location to another. In addition, the process of rounding up and transporting the animals for weighing is time consuming and often difficult. Since a farmer’s profit is dependent upon the weight of the animal, maintaining the animal’s weight throughout the weighing process is important. Arlyn Scales is a leading manufacturer of livestock scales. With our livestock scales, moving the scales into the animals familiar surroundings is easy to accomplish. Our scales are easily transported for use in the field while maintaining the highest accuracy available for livestock scales. We utilize stainless steel load cells, our multipurpose scales are highly accurate and durable for use with livestock. In addition to livestock scales, we manufacture a line of veterinary scales that may be used in the office or in the field. We also produce Alpaca and llama scales that are specifically tailored to the needs of the individuals who raise these animals. Our scales are the top name for weighing devices used for livestock and animals of all shapes and sizes. We manufacture a variety of multipurpose scales for industrial applications. From floor and bench scales to platform scales, We manufacture top quality, durable and rugged scales for all industrial uses. Platform scales are perhaps the most common weighing device found in modern industry. Platform scales may be used to weigh parts and materials, cargo for shipping purposes and containers, among many other uses. 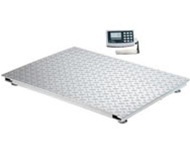 Platform scales may also be used on the receiving dock to ensure that products that are shipped to the company properly reflect the purchased weight. Multipurpose platform scales used for any industrial application are required to be resistant to moisture, durable, rugged and accurate. These scales are constructed with stainless steel load cells to ensure accuracy yet provide the durability necessary for industrial applications. Stainless steel load cells efficiently protect the scales from shock and abuse from overloading. The platform is designed to be low to the ground for ease of use and platforms may be as large as 48Ò x 48Ò to accommodate large cargo. Many industrial applications require that the weight of an object, such as a drum of liquid, be recorded as it changes over time. Industrial liquids must often be closely monitored by tracking the weight of the container. In food manufacturing, ingredients are measured according to a predetermined formula to create a finished food product. For smaller drums and containers, a platform scale may be acceptable. However, for larger containers, floor and drum scales are preferred. With our floor and drum scales, industries may expect the durability and rugged construction that we are known for, along with a high level of accuracy. Drum and floor scales may be constructed with corrosion resistant platform surfaces and may be utilized where corrosive materials are present. We provide the choice of aluminum or stainless steel platforms for our drum and floor units. With our floor and drum scales comes the assurance that they are manufactured with the highest quality materials and the best workmanship available. Multipurpose scales should be equipped with a variety of features to make the scales even more versatile and user friendly. We are available with a wide selection of connectivity methods that allow the user to read the scales remotely and to readily move weight data into other applications for analysis and storage. Data collection functionality is important in many applications for multipurpose scales. For this reason, most of our scales are equipped with a wide range of connectivity solutions to collect data for a range of purposes. Connectivity methods that are available on all models of our scales are USB, Ethernet, RS-232, and analog output. Arlyn Scales can be manufactured with USB ports that enable the user to save weighing results to a USB drive. The USB port is accompanied by free Windows based software. Saving weight data is important for data storage and analysis. Ethernet connectivity is the ability to connect the scales directly to a network. Ethernet connectivity allows the user to remotely access the controls from another location. In addition, weight data may be stored on a network storage device or may be accessed by a computer on the network. Ethernet is considered to be the most effective method of connecting the scales to a network for data collection purposes. RS-232 is a technology precursor to modern Ethernet options. However, RS-232 connectivity is still widely used in agriculture and industry. Therefore, we support this mode of connectivity to connect multipurpose scales to a network. Though most modes of connectivity are based on digital output models, we recognize that some industry and agricultural applications still utilize analog output. For this reason, we have the option to be manufactured with analog output functionality. In addition to multiple modes of connectivity, many of our scales are also being equipped with touch screen control panels for ease of use. Scales may also be equipped with printer ports to send output data directly to forms and labels. Printer ports support inkjet, thermal and dot matrix printers. Labels may be printed directly from the printer or the data sent to a computer and recorded on a printed form. We also produces a software application that enables the user to collect weight data to import to other applications, such as Microsoft Excel spreadsheet or an Access database. This easy to use application is readily available to customers who purchase the necessary connectivity features. Arlyn Scales makes it easy to collect weight data and import it seamlessly into a receiving application for storage and analysis. Arlyn Scales: The Leading Manufacturer of Multipurpose Scales Arlyn scales and components are manufactured in the USA. In fact, our engineers and manufactures parts and components for our scales right on-site in the Long Island, NY facility. On-site component design and manufacturing is one reason that we are able to provide customers with factory direct pricing on all scales. We have been manufacturing weighing devices for all purposes for well over thirty years. We are the leading manufacturer of multipurpose livestock and industrial scales. For more information about our products, including agricultural and industrial scales with enhanced connectivity features check out our online catalog. Experience, quality and ingenuity make us the most trusted name in multipurpose scales.